As most of you know there were some big finales and also the start of another. I had to work last night at Apple so I DVRed them all and watched one right after the other. Lots to cover so here we go. LOST – Great episode. Ben is the good guy, didn’t you know? You’ll see. I also have a theory of who is in the coffin and I believe it’s right on the money. I’ll leave the answer in the comments for those of you woh don’t want to be spoiled. Smallville – I really enjoyed it! Not the best season finale ever but still very good. Michael was stupendous and Kristin taped one of her best performances ever. I might have shed a tear. That scene was great. The writers have a huge mountain to climb for next season. One great thing about the episode was we got a New Dark Knight TV Spot! The Office – GREAT! It’s really the only show (other than the old eps of scrubs) that can make me laugh out loud at least once every episode! Kevin is slowly becoming my favorite character. So bummed Andy stole Jim’s thunder. Ryan? Come on who didn’t see that kid going down in flames. Biggest OMG moment came when Jan made her appearance. I really hope Michael and the new HR lady lay a good base! Tonight is the season 7 finale of Smallville. Tonight is exciting on so many levels, but it is a little bittersweet, for tonight marks the last appearance for Michael Rosenbaum as Lex Luthor. Michael has played arguably the best Lex Luthor the world has ever seen. I’m confident tonight will be his finest performance to date. Here is The CW’s official decription for the season finale Arctic. Tonight is the next to last episode of Smallville before the season 7 finale. Tonight we find out who the last remaining member of Veritas is, and what he wants with Clark. Here is the CW’s official decreption for the episode. Be sure to check out Starkville’s House Of El, after the episode. After 7 seasons of portraying the best Lex Luthor anyone has ever seen, Michael Rosenbaum calls it quits. It comes as a bit of a shock knowing now that this is for real. I guess a part of me thought that he would come around for some type of limited engagement not unlike Kristin Kreuk (Lana Lang), who has also left the show, but will return for at least a third of season 8’s episodes. 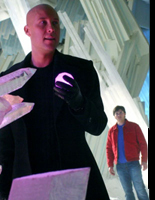 It seems this could be the end of Lex Luthor on Smallville, however in a statement from Smallville executive producers Darren Swimmer, Todd Slavkin, Kelly Souders and Brian Peterson, they eluded to a possible limited return for Rosenbaum, but I’m not holding my breath. It seemed that Rosenbaum has been very adamant and very verbal about his departure from the show as far as a year ago. I would be very surprised if he came back now that the decision has been made official. So the big question is, where does this leave Smallville? I mean let’s take a roll-call shall we? So returning for sure for season 8 we have, Clark, Jimmy, Lois, and Kara. Chloe (Alison Mack) is still in talks, and we’ve already mentioned that Kristin is only going to be in a third of the episodes. There is no doubt in my mind that Alison will be back, since she seems to play a major roll in the show. But we’ve lost Lex and Lionel, not to mention the shows creator’s, Al and Miles, as well as a budget that has been cut in half. So what are we left with? Who will play the villain? Glad you asked, because this is where it starts to go south. According to Smallville executive producers Darren Swimmer, Todd Slavkin, Kelly Souders and Brian Peterson, DOOMSDAY will make an appearance! WHAT? Wait WHAT? Doomsday? Really? Seriously, what will Superman have left to do at this point? I mean fear is no longer going to be keeping Clark from becoming the Man Of Steel, boredom will! The Dude will have no one to fight! Another new villain will also be introduced in the 8th season. A fem fatal to be named later. Apparently what will make her so dangerous is the shared attraction between her and Clark. All-in-all I am starting to get a little worried. I will still love Smallville because of it’s history and because I have been a fan for so long. As you know love covers a multitude of sins, but I worry about the new viewers. They might not be as forgiving as those who love the show. But hey it’s the last season so I suppose they don’t have much to worry about. CLARK SEES WHAT LIFE WOULD BE LIKE IF HE HAD NEVER ARRIVED ON EARTH; TOM WELLING DIRECTS — Clark (Tom Welling) discovers that Kara (Laura Vandervoort) sent messages from Krypton in the past that indicate that Brainiac (guest star James Marsters) wants to kill Baby Kal-El so Clark will not exist in the future. Clark is torn because he thinks the world would be better off if he had never arrived in Smallville. Tonight marks a point in history for Smallville. Things will never be the same for many characters after this episode. Tonight someone will take their last breath and there is no coming back. This also marks the first of 5 post-strike episodes for Smallville. Here is the CW’s official description of the episode. Be sure to come back here after the episode for a little discussion. Also be sure to check out a special edition of Starkville’s House Of El later on this weekend. You won’t want to miss it. Lois (Erica Durance) follows Lex (Michael Rosenbaum) to Detroit and discovers he has found Kara (Laura Vandervoort), who has amnesia. Finley (guest star Corey Sevier), a busboy who is obsessed with Kara, fears Lex will take her away, so he shoots Lex and holds Kara and Lois captive. After Lex’s comatose body is found, Chloe (Allison Mack) offers to heal him, but Clark (Tom Welling) refuses to let her.